The different incarnations of Goblin are about as varied as the Gong family tree. The current band, Goblin Rebirth, contains two members from the mid-70s, Fabio Pignatelli (bass) and Agostina Marangolo (drums and percussion), plus three new members Giacomo Anselmi (guitar and bouzouki), Aidan Zammit (keyboards), and Danilo Chermi (keyboards). 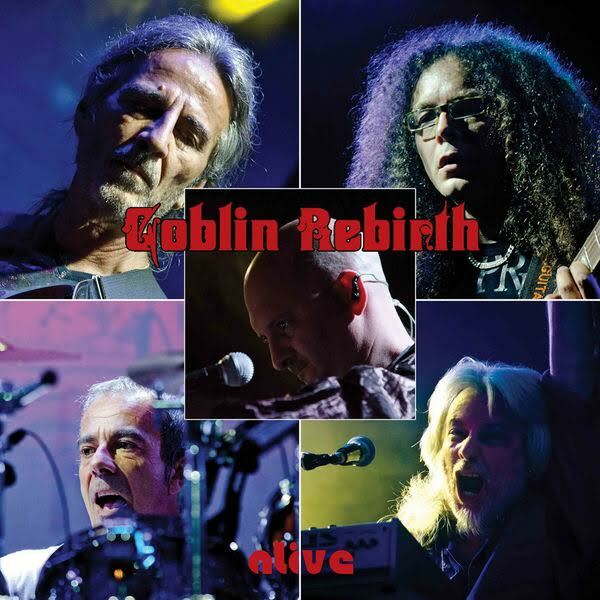 On April 22, 2011 Goblin Rebirth performed live in Rome and the entire concert in front of an enthusiastic crowd was recorded and now available both as a double CD set and a DVD. The band performs their movie soundtrack classics from Profundo Rosso and Suspiria along with several instrumentals they’ve never performed live: “Buio Omega,” “Connexion,” “La Chiesa,” “Death Dies,” “Witch,” and “Le Cascate di Viridian.” If someone were to ask me to summarize this concert in one word, I would say confident. Every single one of the 18 instrumentals is executed with conviction and the same energy as 40 years ago. There is no timidity in the performance. The band members clearly know and love these tunes, making no apologies as they step through one instrumental after another over the course of nearly two hours. And the audience is clearly enthralled by their performance. The only missing element, and this is unavoidable as musicians tend to part ways over the years, is the absence of their original keyboardist Claudio Simonetti. For those of you unfamiliar with Goblin and their horror movie soundtracks for Dario Argento, this new live set is a great place to start exploring their music.